VAC S54 Valves are precision made to exacting specifications and are suitable for street performance, or full race vehicles. 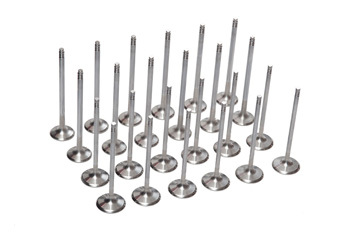 Not only is their performance enhanced over stock; while having considerably less weight than OE, they even work great in street vehicles for day to day use where engine build up and byproducts can harm typical "race valves". Our valves have proven their worth on max performance and all-out race engines, surviving lap after lap, race after race, and even multiple seasons without being replaced! Fixing method / Groove type ALL of our S54 valves are Single Groove as preferred for S54 race engines. Valve Sizes -OE size is recommended for use with VANOS equipped engines. -For serious high-power race builds, +1 oversized is available for race engines with VANOS eliminated. Material -Each OE size valve is made from premium stainless steel alloy for superb strength. -To withstand serious power output, our plus-one millimeter (+1) valves feature Inconel exhaust construction for high output large cam and aggressive race builds, or big power FI setups. These valves dramatically reduce valve weight and this improves valve train reliability greatly as the valve springs do not have so much mass to control. Oversized valves can help enhance maximum engine output when used along with large camshafts but we do recommend keeping VANOS and stock size valves for everything but max race builds. MUST be used with single-groove 6mm valve locks / keepers. Intended for use with 6mm VAC locks, but can be used with other valve locks.